Heat oven to 425°F. In medium bowl, toss Potato Filling ingredients, coating pieces evenly. Arrange on ungreased large cookie sheet. Bake 25 minutes; stir. Bake 15 to 20 minutes longer or until golden brown and crispy. Meanwhile, mix Herbed Salad ingredients, stirring well; set aside. In 2-quart saucepan, heat 2 cups water to boiling. Add quinoa; cook 10 minutes. Drain well. Arrange on another ungreased cookie sheet; toss with 2 teaspoons oil. Place cookie sheet of quinoa in oven with sweet potatoes during last 10 minutes of bake time to toast lightly, stirring once. 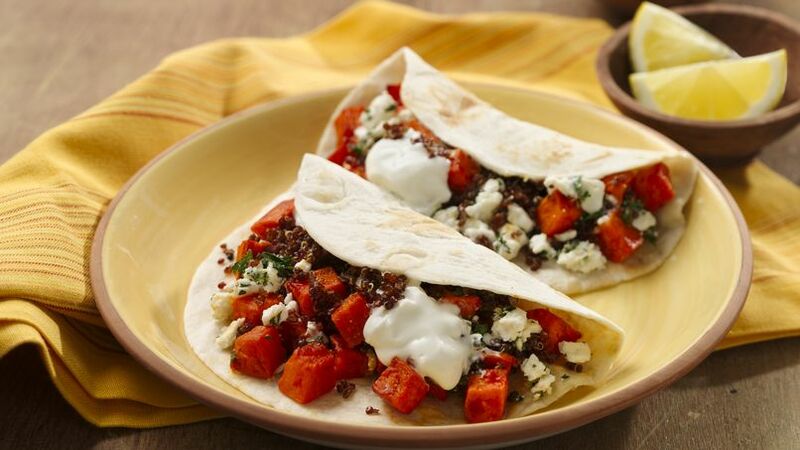 Fill each tortilla with potato filling, salad, a dollop of yogurt and 1 tablespoon toasted quinoa. If you have leftover toasted quinoa, use it to top salads and other dishes for a delicious, nutty crunch. Harissa is a Middle Eastern condiment that adds spice and fabulous flavor. Since these condiments vary in levels of spice, be sure to taste yours before adding it to determine how much is needed.